Happy Friday! It's finally starting to feel like spring (now that the 7 inches of snow we got last week has melted), so I'm in the mood to share a spring freebie! 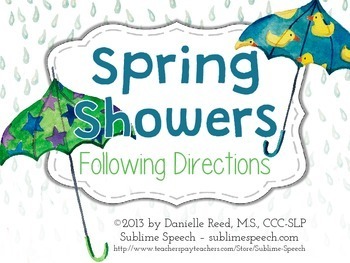 This Following Directions set from Sublime Speech is a fun game that you can play to help your little ones practice multi-step directions. Use the game mats that are included, or use the cards during large group activities so that everyone can practice together!Download your set and have a great weekend!